Litter is one of the issues that has been identified as an area that needs to be addressed in the SEMS Annual Monitoring and its subsequent Delivery Plan. It is currently categorised as a low risk activity in terms of its impact on SEMS sites, but there is growing concern about the growth of microplastics in the marine environment and their potential ecotoxic effects. Marine litter is any manufactured or processed solid material from anthropogenic activities that are discarded, disposed of or abandoned once entering the marine and coastal environment including: plastics, metals, timber, rope, fishing gear etc. and their degraded components, e.g. microplastic particles. Ecological effects can be physical (smothering), biological (ingestion, including uptake of microplastics; entangling; physical damage; accumulation of chemicals) and/or chemical (leaching, contamination). It can also be a possible vector for the transfer of alien species. Although the relative proportions of these materials vary regionally, there is clear evidence that plastic litter is by far the most abundant type. In some locations plastics make up 90% of marine litter of shorelines. A similar predominance of plastics is reported from sampling at the sea surface and on the seabed. The Marine Conservation Society's annual Beach Clean Campaign records the amount and types of litter found on UK beaches. The number of plastic bottles found on UK beaches was the big story of the 2015 Great British Beach Clean. In almost every part of the UK the number of bottles our volunteers found went up compared to 2014. Microplastics are small plastic particles in the environment that are generally between 1 and 5 mm (0.039 and 0.197 in) although some are invisible to the human eye. Microplastics are mainly composed of six polymers: polyethylene, polypropylene and expanded polystyrene, which are more likely to float, and polyvinyl chloride, nylons and polyethylene terephthalate (PET), which are more likely to sink. Microplastic sources include industrial products such as paints, abrasive cleaning agents and tyres, and personal care products such as toothpaste and skin cleaners, as well as fragmentation of larger plastics dumped into the oceans. After entering the ocean, microplastics can be distributed globally with especially high concentrations in ocean gyres, but also close to population centres and shipping routes. Microplastics have been found on beaches, in surface waters, seabed sediments and in a wide variety of marine life. Plastics tend to absorb and concentrate contaminants from surrounding seawater and can also contain a high proportion of additive chemicals incorporated during manufacture. The UK government has announced that legislation will be introduced in 2017 to ban the sale and manufacture of microbeads. Southampton Solent University have been undertaking research into the prevalence of microplastics in the Solent. 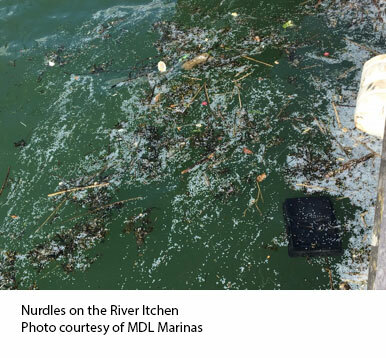 In 2017, MDL marina staff undertook a foreshore cleaning exercise to tackle widespread littering of plastic nurdles on the foreshore at MDL Shamrock Quay.Over a period of 2 hours, 40kg of litter,was collected of which 60% was estimated to be nurdles. Given the weight of an average plastic nurdle is 20mg, it is estimated that 1.2 million nurdles were collected and suitably disposed. MDL believe that less than 10% of the marine litter on the foreshore was collected over this period, which would suggest there is probably at least another 10 million nurdles scattered across the foreshore. In Scotland the Great Nurdle Hunt to tries to assess and address this problem. The Marine Conservation Society has been leading calls for changes in the wet wipes labelled as ‘flushable’ and has been driving collaboration on this issue. While some wipes are labelled as ‘flushable’ they are failing to adhere to the guidelines set out by water companies internationally. Read more in the Water UK letter to the trading standards office. GOSE report, Future of the sea: plastic pollution, 2017.